Yesterday, we went to the Temple of Heaven. At the entrance, there was a park we got to visit. It was interesting because the forms of exercise were different from those of America. 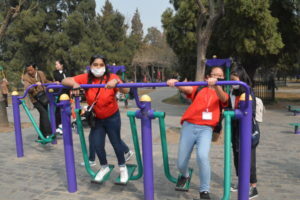 For example, many of the people were playing with hacky sacks and others were exercising on bars (parallel bars, pull up bars, etc.). One man did 40 flips around the bars – just like gymnast. The temple itself was also very interesting. 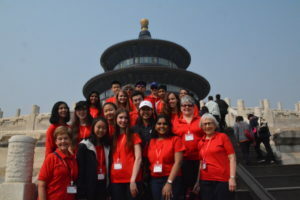 Although the Temple of Heaven wasn’t very tall, it appeared to be. The street combined Chines art and architecture and was round to the represent the heaven. I ended up tripping and falling down the stairs of a nearby building and a fried joked that I “fell from heaven.” I obviously have no major injuries (no minor injuries either) because I am writing this post. Afterwards, we went to this section of the park where parents were arranging their adult children’s’ marriages. It was surprising how many people were there. 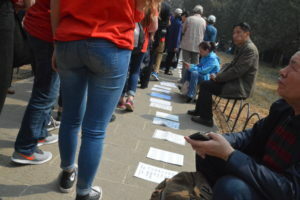 The ground was full of papers showing their children’s gender and ages. Quite an interesting read. Have fun and watch your steps!